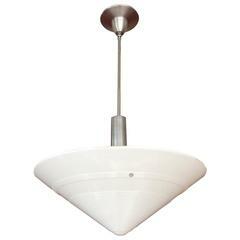 Large 20" diameter Sasco solid brass pendant with 8" satin milk glass globe. Satin, polished, or aged brass; and painted finishes. Glass globe can be matte or gloss white. Overall drop height can be customized. 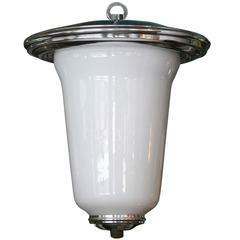 Wired with a single standard Edison socket for use with an incandescent or LED bulb. Avantgarden Ltd. cultivates unexpected and exceptional lighting, furniture and design. To view items in person please visit our showroom in Pound Ridge, New York. Satin, polished, or aged brass; and painted finishes. Glass globe can be matte or gloss white. Overall drop height can be customized. Wired with a single standard Edison socket for use with an incandescent or LED bulb. Upcharge for UL certification upon request. A voluminous globe lightens up all directions and creates a simple statement for any room. Customization options Custom sizes and finishes available. 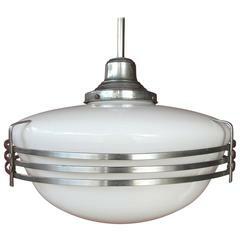 Large stepped Art Deco ceiling mounted school house mounted globe with new UL compliment chrome fitter. Globe, circa 1930 Available two.